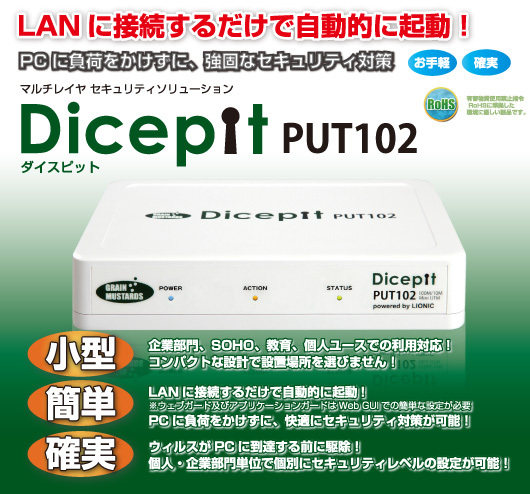 Dicepit is a security box that can be security measures comfortably without putting a load on your PC. Not difficult settings, etc., it automatically starts by simply connecting to the LAN, to prevent the invasion of the virus. Information of virus definitions, others are automatically updated via the Internet. ・The detected at the packet level virus and malware, worms, Trojan horses, and back door, and then disinfected. ・Against unknown vulnerabilities that exist in the application or operating system used by a user, I protect it from hackers. ・Added a function so that you can be matched with the URL database malicious, it prevents the HDD itself is exposed to Web. ・You can set the limit individually IM such as Skype or GoogleTalk to (InstantMessage) application. ・You can set the limit individually P2P such as BitTorrent to (peer-to-peer) applications.